Shooting Drill JJRC JJPRO X5 EPIK FullHD GPS. The perfect drone for the dog who wants to produce awesome movies and images in FullHD. JJRC's JJPRO X5 EPIK is an epic, high quality and versatile helicopter for many different occasions. 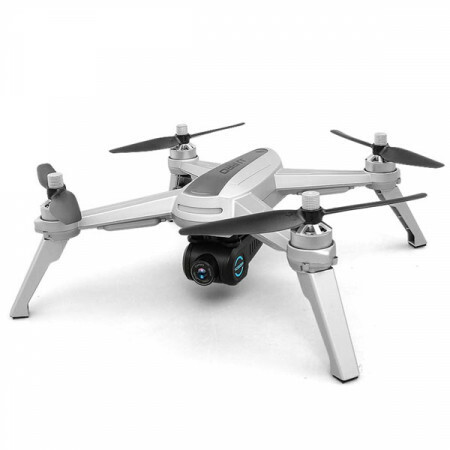 It is equipped with a GPS receiver and a FullHD camera that can be remotely controlled during the flight. The drone's flight functions are very versatile. GPS receivers and elevation features take care of the fact that the drone will remain stable in the air. In addition, they allow functions such as automatic return, waypoint flight and tracking or rotation around objects. X5 EPIK's FullHD camera is of really good quality and good wide angle. In addition, just as drones in the more expensive segment, the angle of view can be controlled from the remote control during the flight. The remote control is easy to use and has its own LCD screen that describes basic information about the helicopter, even if it is not connected to the smartphone via WiFi. Of course, your smartphone can preview camera video live and perform the above-mentioned advanced flight features. A really good looking and naughty drone. A great starter package for those who are curious about aerial photography! https://www.e-ville.com/en/3045385-kuvauskopterit/31740-jjrc-x5-epik-gps-drone-fullhd.html 31740 JJRC X5 EPIK GPS-drone FullHD http://www.e-ville.com/img/p/31740-160275-fb.jpg 184.95 GBP InStock /TV ja kotiviihde/RC Vehicles/Helicopters/Imaging drones /TV ja kotiviihde/RC Vehicles/Helicopters /TV ja kotiviihde/RC Vehicles /TV ja kotiviihde Shooting Drill JJRC JJPRO X5 EPIK FullHD GPS. The perfect drone for the dog who wants to produce awesome movies and images in FullHD.